Prefer to dive right into code? Check the relation project in the example repo. Objects may reference other objects, for example using a simple reference or a list of objects. In database terms, we call those references relations. The object defining the relation we call the source object, the referenced object we call target object. So the relation has a direction. If there is one target object, we call the relation to-one. And if there can be multiple target objects, we call it to-many. Relations are lazily initialized: the actual target objects are fetched from the database when they are first accessed. Once the target objects are fetched, they are cached for further accesses. If the customer object does not yet exist in the database, the ToOne will put it. If it already exists, the ToOne will only create the relation (but not put it). See further below for details about updating relations. Note: if your related entity uses self-assigned IDs with @Id(assignable = true) it will not be inserted. See below about updating ToOne for details. This will do a database call on the first access (lazy loading). It uses lookup by ID, which is very fast in ObjectBox. If you only need the ID instead of the whole target object, call getTargetId() instead. It can be more efficient because it does not touch the database at all. Note that this does not remove the customer from the database, it just dissolves the relationship. If you look at your model in objectbox-models/default.json you can see, a ToOne property is not actually stored. Instead the ID of the target object is saved in a virtual property named like the ToOne property appended with Id. You can change the name of the expected target ID property by adding the @TargetIdProperty(String) annotation to a ToOne. Did you notice that the ToOne field customer was never initialized in the code example above? Why can the code still use customer without any NullPointerException? Because the field actually is initialized – the initialization code just is not visible in your sources. If your setup does not support transformations, like non-Android Kotlin code, add the above modifications yourself. You also will have to call box.attach(entity) before modifying ToOne or ToMany properties. To improve performance when ObjectBox constructs your entities, you should provide an all-properties constructor. For a ToOne you have to add an id parameter, typically named like the ToOne field appended with Id . Check your objectbox-models/default.json file to find the correct name. To define a to-many relation, you can use a property of type List or the ToMany class. As the ToOne class, the ToMany class helps you to keep track of changes and to apply them to the database. If you do not need or want that, use type List and take care of applying database changes yourself. Note that to-many relations are resolved lazily on the first request, and then cached in the source entity inside the ToMany object. So subsequent calls to the get method of the relation do not query the database. There is a slight difference if you require a one-to-many (1:N) or many-to-many (N:M) relation. 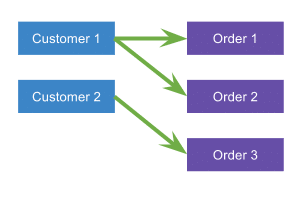 A 1:N relation is like the example above where a customer can have multiple orders, but an order is only associated with a single customer. An example for an N:M relation are students and teachers: students can have classes by several teachers but a teacher can also instruct several students. The @Backlink annotation tells ObjectBox which ToOne relation to use to populate the list of orders. If there would be multiple to-one relations using Customer inside the Order class, you would need to explicitly specify the name like @Backlink(to = "customer") . If the order entities do not yet exist in the database, the ToMany will put them. If they already exist, the ToMany will only create the relation (but not put them). See further below for details about updating relations. Note: if your entities use self-assigned IDs with @Id(assignable = true) the above will not work. See below about updating ToMany for details. If the teacher entities do not yet exist in the database, the ToMany will also put them. If they already exist, the ToMany will only create the relation (but not put them). See further below for details about updating relations. The ToOne and ToMany classes assist you to persist the relation state. They keep track of changes and apply them to the database once you put the entity owning the relation. ObjectBox supports relation updates for new (not yet persisted; ID == 0) and existing (persisted before; ID != 0) entities. setAndPutTarget(entity) makes the given entity (new or existing) the new relation target and puts the enclosing entity and if needed the target entity. This is because ObjectBox only puts related entities with an ID of 0. See the documentation about IDs for background information. The ToMany class implements the java.lang.List interface while adding change tracking for entities. If you add entities to an ToMany object, those are scheduled to be put in the database. Similarily, if you remove entities from the ToMany object, those are also scheduled to be put. Note that removing entities from the List does not actually remove the entity from the database; just the relation is cleared. Do not forget to put the owning entity to apply changes tracked by ToMany objects to the database. In this case, when putting the parent entity only the relation is updated. This is because ObjectBox only puts related entities with an ID of 0. See the documentation about IDs for background information.